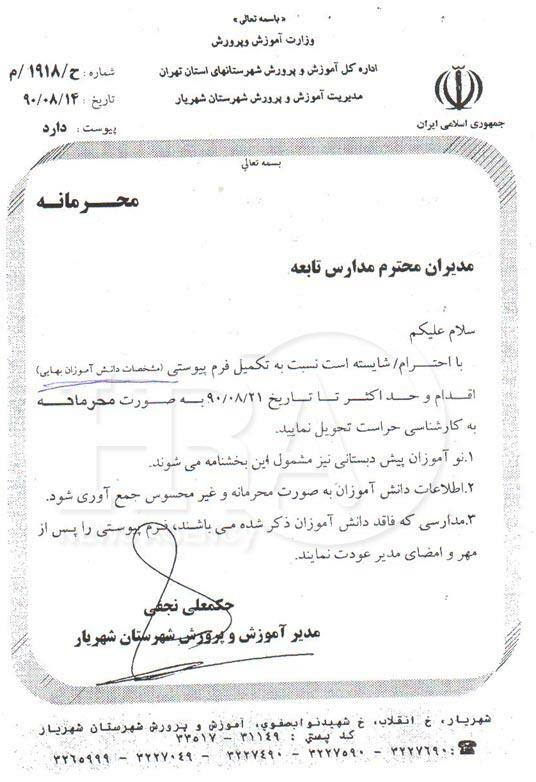 On 14 Aban 1390 [5 November 2011], the District Supervisor of the Board of Education for the city of Shahriar (located within the Province of Tehran) instructs, in a confidential memorandum, the subordinate school principals in its jurisdiction to discreetly obtain personal information of Bahá’í students and submit them to the Security Section of the District Office no later than 21/8/90 [12 November 2011]. Respectfully, please complete the enclosed form (details concerning Bahá’í students) and submit them to the Security Section of the District Office in a discreet manner, not later than 21/8/90 [12 November 2011]. 1. Pre-school students are also included in this directive. 2. Information on the students should be gathered subtly and in a confidential manner. 3. Schools in which there are no Bahá’í students should return the enclosed form after it is signed and stamped by the school principal. published contents on this site are their author's views and they are not necessarily the aasoo's view.